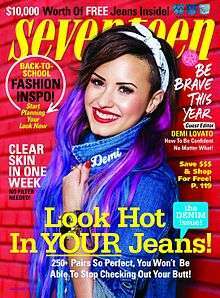 Demi Lovato on the cover of the August 2014 issue. In 2010, writer Jamie Keiles conducted "The Seventeen Magazine Project", an experiment in which she followed the advice of Seventeen magazine for thirty days. In 2012, in response to reader protests against the magazine's airbrushing its models' photos, Seventeen ended its practice of using digital photo manipulation to enhance published photographs. (See more below under Controversy). In August 2016, Michelle Tan was fired from her position as Editor in Chief while she was on maternity leave. It was announced shortly thereafter that Michele Promaulayko, who was appointed Editor in Chief of Cosmopolitan, would also serve as Seventeen's editorial director. Starting with their Dec/Jan 2017 issue, the magazine was to start publishing only six issues a year instead of ten, to focus on their online presence to appeal to the Generation Z market. In April 2012, 14-year-old ballerina and blogger Julia Bluhm from Waterville, Maine created a petition on Change.org titled "Seventeen Magazine: Give Girls Images of Real Girls!' advocating for the magazine publication to vow to print at least one unaltered and Photoshop-FREE monthly photo spread". Julia Bluhm is a "SPARK Summit activist" and declared that "as part of SPARK Movement, a girl-fueled, national activist movement, I've been fighting to stop magazines, toy companies, and other big businesses from creating products, photo spreads and ads that hurt girls' and break our self-esteem". In May 2012 Julia Bluhm, her mother, and a group of fellow SPARK Summit activists were invited to the New York headquarters of Seventeen by editor-in-chief Ann Shoket. On 3 July 2012, Bluhm officially won her petition upon receiving almost 85,000 (as of 23 February 2015, 86,435) signatures, resulting in Seventeen's editorial staff pledging to always feature one photo spread per month without the use of digital photo manipulation. Furthermore, Seventeen's Ann Shoket published The Body Peace Treaty in her editor's letter of the 2012 August issue, as an extension of the magazine's ongoing Body Peace Project. ↑ "eCirc for Consumer Magazines". Audit Bureau of Circulations. June 30, 2013. Retrieved November 5, 2013. ↑ "Seventeen Delivers Almost Twice The Audience of Teen Vogue". Seventeen Actionista. Hearst Magazines. Retrieved 7 January 2011. ↑ "Tweens, Teens, and Magazines" (PDF). Kaiser Family Foundation. January 2013. Retrieved 19 August 2015. ↑ "Magazines in Alphabetical Order". Radcliffe Institute. Retrieved October 19, 2015. ↑ Massoni, Kelley (March 2006). "'Teena Goes to Market': Seventeen Magazine and the Early Construction of the Teen Girl (As) Consumer" (PDF). The Journal of American Culture. 29, Number 1 (Theme Issue).